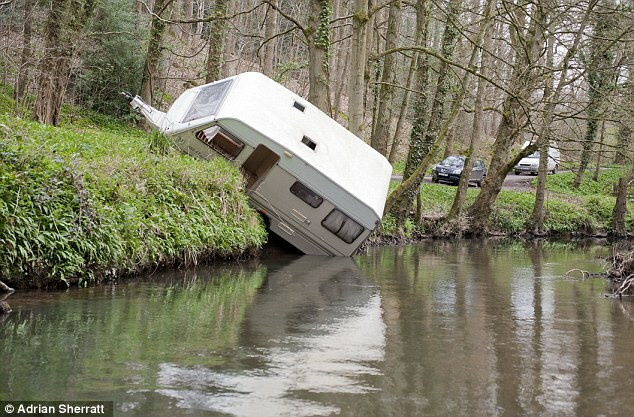 Towing a caravan. That looks terrifically complicated. Particularly when going backwards. And there’s no log burner. Being a day fisherman, making a living putting to sea in a small day boat out of some beautiful yet rugged and exposed Cornish Village. I’ve never harboured ambitions to join them. Yet, having had a delightful medley of locally caught mackerel, bass, cod and lemon sole as my delightful 50th birthday lunch, I am deeply grateful that there are plenty of braver souls than I who HAVE made that career choice. We had this lunch in the most southerly cafe in mainland Britain, on The Lizard, Polpeor Cafe. I don’t know WHY we come here…. Nicky and I were both born on February 10th (ahhhh ❤) and we had stayed in the same cottage as we did two years ago, on the coast path just outside Cadgwith, when we celebrated her 50th. 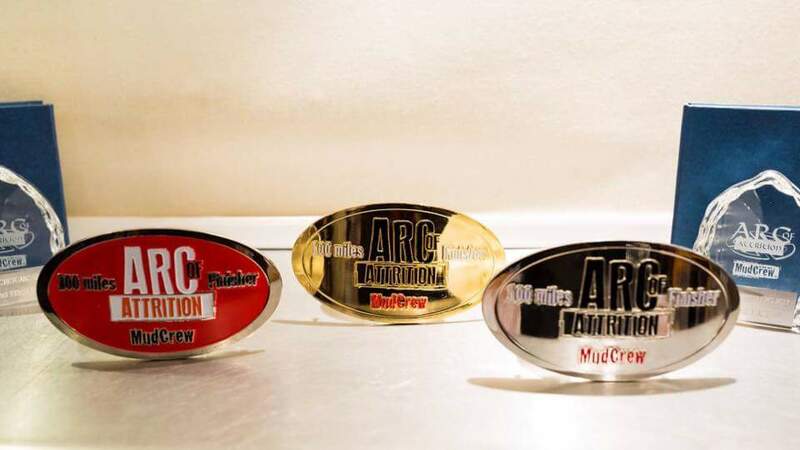 We felt honoured and blessed that this was also the (first) day of The Arc Of Attrition. 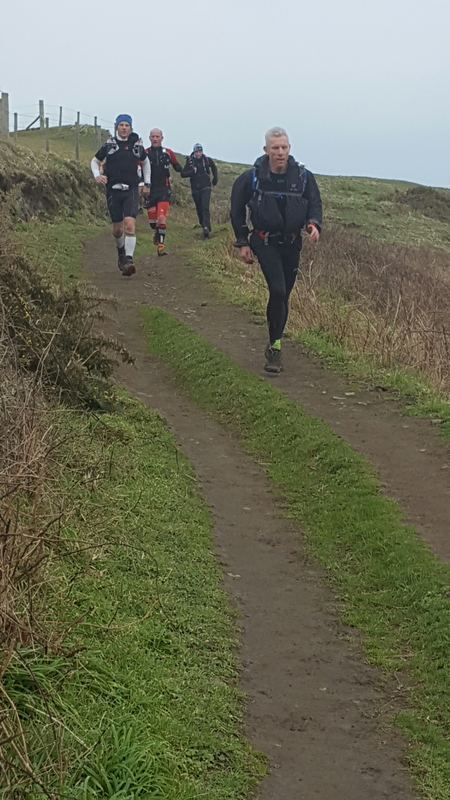 The 100 mile ultra marathon started at midday in Coverack and finished for those that made the whole distance in Porthtowan before the midnight cut off the following day. 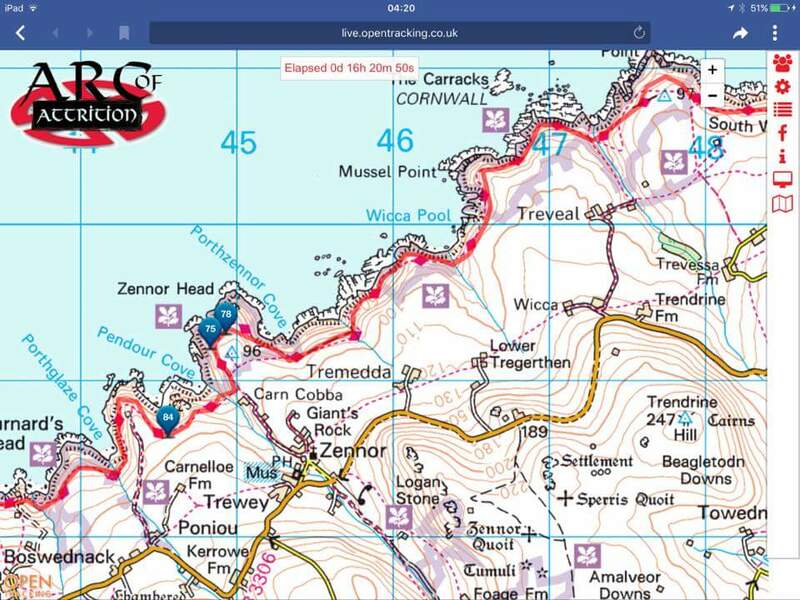 The route follows the stunning yet torturous South West Coast Path along the south, through Lands End and up the North coast. We timed our birthday lunch so that our walk back to the cottage gave us the chance to cheer each and every one of the runners as they were approaching about 8 miles into their epic journey. It was humbling to see. Other things I’m glad to say I’ve never been tempted by? Parachuting, trapeze (or any other circus related skill), far too much bravery and natural balance required, for I am a clumsy soul. I may or may not have had a muddy tumble or two on the trails last week! 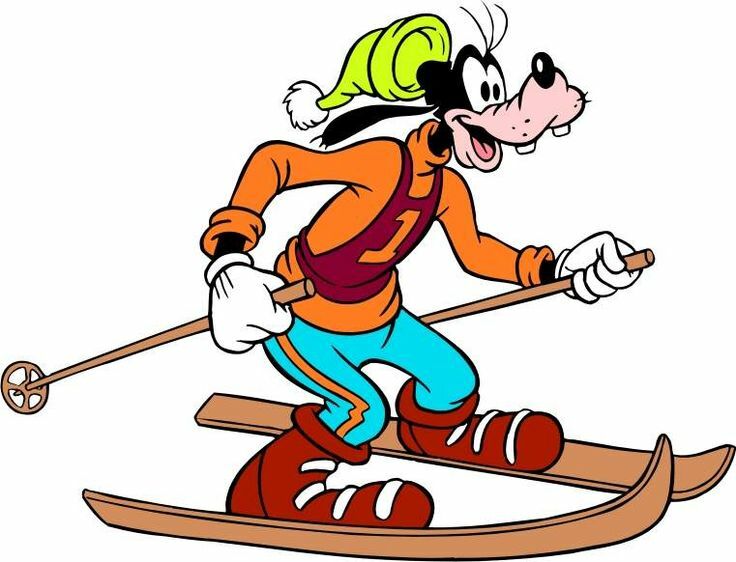 Skiing, too, aside from a (very) brief dalliance in the early 90’s on a dry ski slope (a hazy period to be honest), is to be left alone by the gangly one. The AoA runners need to be well equipped for all of these skills, needing bravery, balance, commitment, determination and grit. They have to roll with the bumps and bruises and expect them I imagine. The wind was pretty wild on the exposed sections, challenging even in the relatively short distances we covered. 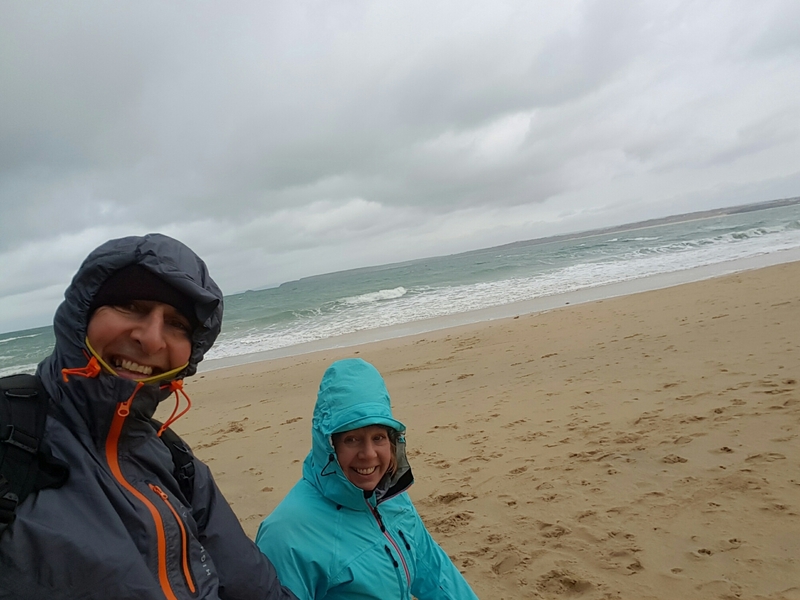 On Saturday, we drove to the north coast and parked at Carbis Bay and walked to, and through, St Ives where the (I believe) 75 or so mile checkpoint was situated. The runners were well spread out, in fact the winners were already having a warming cup of tea or better along the coast at Porthtowan. We gave as much encouragement as we could as the runners came through all the Saturday pedestrians, there were some thousand yard stares going on but, such courage. I think I’m right in saying that all but one of the runners who made the cut off in St Ives, also made the finish. I am humbled by anybody making the start line, never mind the finish line and I have to say Nicky and I had a quiet moment or two contemplating the tracker; there were competitors out there on the extremely remote and exposed 13 mile section approaching St Ives who will have known that once they arrived there, their battle was over, no finishers buckle for them, but hopefully a heart full of pride for their monumental effort. Each competitor carries a tracking device, primarily a safety device which has a SOS function should the runner become isolated and stranded. This linked to a tracking website which means the organisers and crew, friends and family, and us nosey parkers, could see the position of every competitor throughout the race. Addictive stuff I can tell you. It was approaching 2pm in St Ives, the cut off time as the weather started to become wetter and windier and colder. Those that had made it that far had another 10 hours to make the finish, heading straight into these conditions. Their exhausted, battered bodies and weathered and stretched spirits must have been begging them to stop. 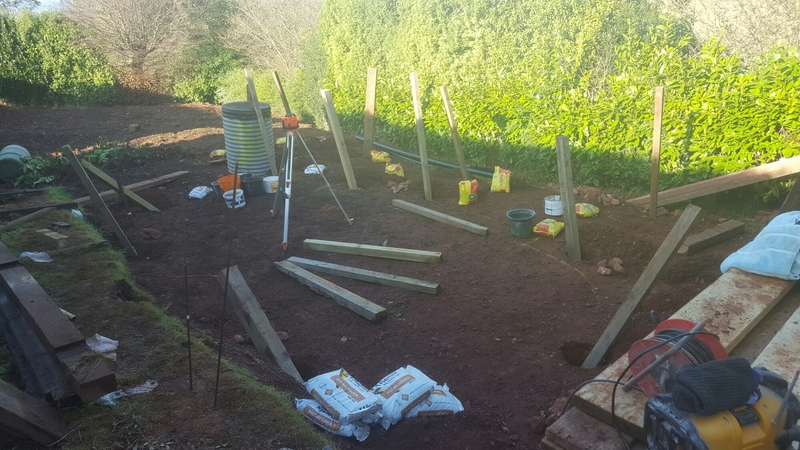 We chatted to one the many incredible Mudcrew marshalls, a veteran of the event who provided us with even more insight into the event and the fabulously devoted people associated with it. Just for giving us the absolute pleasure of the feeling of having been so close to something epic, I nod my head wildly to all the runners, crew and support teams. 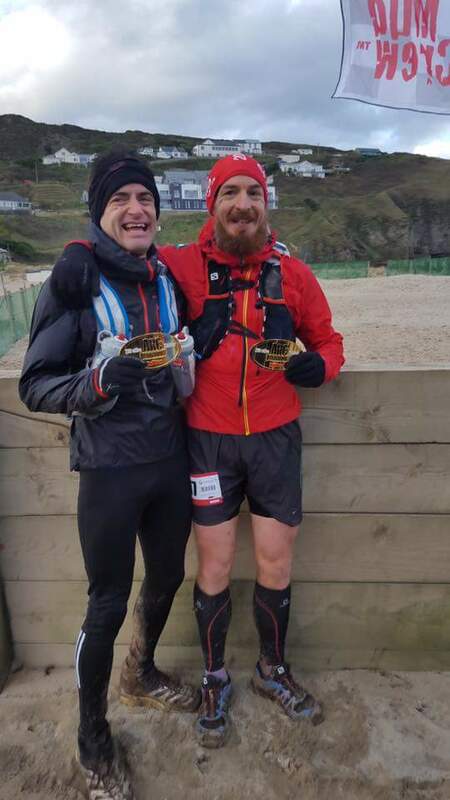 A mention for Paul Maskell and Steve Wyatt who finished together in a course record of 21 hours 26 minutes. Blimey! I’m pretty confident I will NEVER learn the didgeridoo (doesn’t that echo in the underpass in Truro), nor for that matter the bagpipes…..
As for the Arc Of Attrition, I mean who would want to travel 10o miles, on foot, on the Cornish Atlantic coast, in February, with maybe 20 hours of darkness in the 36 hours allowed………. I mean, who would want one of these……. Running back toward Chesil Beach, with about 2 miles left of lap 1 of the Portland Coastal Marathon, we ran past two boarded up public houses. Being a ‘failed’ publican myself, I always take a moment to think of the final, departing guardians of these, presumably once thriving, seaside hostelries. We had decided to turn up and have a crack at the marathon despite neither of us feeling particularly bright in the build up. It has been a tiring and demanding couple of weeks and sleep has been at a premium rather. It became quite apparent early in the race that we were going to be struggling to be inside the organiser’s cut off time of 6 hours. We had lengthy and honest discussions about how we felt about this being the first Did Not Finish either of us have ever experienced. We aren’t spring chickens, we’re the first to recognise that, but Nicky and I are veterans of 27 and 29 marathons and ultra marathons respectively. We understand the importance of respecting the distance, the terrain and conditions. I digress, but we do on occasions, whilst out running, have conversations around why we choose to run together for most of our marathons and for many of our training runs, rather than chasing individual times. The reason? I simply love running with my beautiful wife. 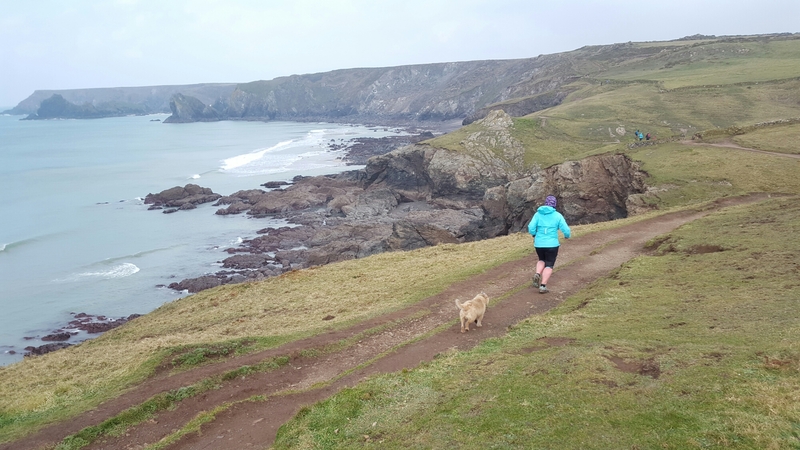 Interestingly (and again, I’m digressing, although the topic is ‘elitism’ so it sort of ties in), when we did the Dartmoor Discovery last year (a 50km ultra marathon over the hilly roads of Dartmoor) we encountered another couple running together. The male runner was quick to make us aware that OBVIOUSLY he wouldn’t ordinarily run so incredibly slowly! He was, of course, lowering himself by allowing himself to be seen near the back of the field as he was supporting his (extremely embarrassed) wife. Patronising so-and-so. Anyway, back on Portland, passing these relics of a bygone drinking era, some runners who were far, far ahead of us came past in the opposite direction. This is a two lap race with a difference, the second lap is run in the opposite direction to the first. This means that all of the runners will encounter each other travelling the other way. Not only that, the half marathon started 30 minutes after the marathon resulting in a steady stream of runners coming past us, reinforcing the sensation that we might be moving relatively slowly. My rather splendid, and quite beautiful wife occasionally has a confidence issue around how others might perceive her running, that her running is in some way less worthy. This is, of course, absolute nonsense. As I have said, she is a veteran of 27 marathons and ultra marathons. This includes her ‘fifty miles for fifty years’ smashing of the South Downs Way 50 mile race to celebrate that landmark birthday. She trains hard and endeavours to be as well prepared as possible for every event. Where were we? Oh yes, outside The Closed Arms and Three Bankrupt Feathers as two particular runners came past in the opposite direction. “Hi, well done mate”, “good running fella” we chided, or words to that effect. A sneering, up and down look with what I perceived to be a rolling of the eyes was the first guys considered response. The second chap went for looking as far away from direct eye contact as he possibly could whilst attempting to exude the nonchalant air of someone trying hard not to stare at the non-athletic efforts of those of us running at bang on cut-off pace. Unfortunately Nicky was already on her downers, knowing we were on our way to pulling out at the halfway point, having had the tail running marshals in close proximity for many miles, full of head cold and battling into a freezing headwind . What a lift these guys could give others with a simple acknowledgement of shared efforts and experiences of a tough race in tough conditions. “In what way does he think his run is any better than ours?” I mused. “Well, for a start he’s probably going to run ALL of it!” My self-depreciatinly humorous wife quipped. These are guys are probably top 15 or so, right up there at the sharp end, but their miles are no longer than ours, their medals no more, no less, deserved. Now, I completely understand that if you are running, eye balls out, chasing your best possible time, not wanting to divert your focus from the finish line goal, then you are probably not going to want to lean against a tree chatting to every runner you pass. I also know that it is possible to to acknowledge others without breaking focus or rhythm. Interestingly, the chap who was (clearly) leading the race gave us a big thumbs up, smile and “good running” type shout as he whistled past. A word about his kit. Obviously he passed quickly, but I did note his baggy, unbranded top and Karimore shorts. Should he, by some chance, read this, I hope he takes this as a compliment in the spirit in which it is intended. Suffice to say, he had a reassuringly rugged and shambolic air about him. Like those fabulous photographs of champion fell runners, tearing down 1 in 3 descents of loose scree. You know the guys, fearless as they skim the terrifying terrain in what looks like their old P.E. kit. My point being, maybe a little bit further down the field, maybe some of the runners have a little bit of kit snobbery to compliment their pace snobbery. Talking of which, there’s a particular bloke I see regularly when out on my favourite early morning road runs. He always returns my greeting when I’m running alone but quite blatantly turns his head and ignores us when I’m running with Nicky. This, of course, has led to a childish, ear-splitting 5.30am duet of “GOOD MORNING!” whenever we see him. Another runner local to us springs to mind. Someone I know well. He’s a faster runner than either Nicky or myself but chooses to acknowledge me, but not Nicky if she sees him when she’s running alone. Pace snobbery? If it is, then where does it stop? Nicky generally finishes with about 25% of the field behind her in a trail marathon. Does that mean she should start ignoring a quarter of the runners she encounters? Poor old Wilson Kipsang must have nobody to speak to! A coastal marathon we entered in January was cancelled at fairly short notice after quite severe weather along that stretch of coast. We had already travelled and had a hotel booked so we chose to do what many others did and went anyway. What would have been race day was blessed with calm weather and the courses were still marked out . We ran from our hotel, crudely followed the half marathon course before running back to the hotel. A total of about 18 lovely miles on the coast. BUT the kit snobs were out in force, literally looking us up and down before openly ignoring us. Two guys overtaking us actually stopped talking, slowed down to fully take in the shuffling middle aged couple, me in my head-to-toe Sports Direct/Decathlon combo, before sniggering and accelerating away to resume their new-monied, self-important, self-congratulatory back slapping. Or something. At another coastal trail marathon last year, as we parked up the old Mini, banging last weeks mud of our running shoes, some younger chaps pulled up in front and exited their massively oversized Chelsea tractor. One of them called over (and these may not have been his exact words) asking for shoe advice. “You there, poor person, I say old boy, roadies, trailies or spikes?” Speechless. So, kit snobbery. Pace snobbery? We have a very good friend in local running who goes out of his way to acknowledge each and every runner he encounters. He encourages and congratulates everybody on their achievements. This guy is a prolific race winner and not just of minor races. Pace snob? Nah. I’ve crossed the line in races and he’s been so keen to talk about how I’ve got on its been 5 minutes before I’ve found out he won the thing! Kit snob? Well, he’s a father of a young family , working night shifts in a supermarket and was winning off road races on all sorts of terrain and over many distances before he bought himself a pair of trail shoes! Those shoes split recently and he superglued them together before winning another race in them. The superglue dried hard and gave him horrid sores on his feet. He promptly gaffer taped his foot and got out training the next day. Having recently treated himself to a running watch he reckons he can train even better now! Too bloke. Going back to the Dartmoor Discovery, 2nd lady that day finished in the lightening time of 4h 18m 04s, yet when Nicky and I turned the corner to see that we had beaten the cut off (6h30m) by 2 minutes and 18 seconds , there she was jumping up and down and celebrating our success as much as she had done her own. Pace snob? Hardly. It would be too easy and too lazy to simply say that certain people are attracted to certain events. I suppose, by their very nature, a lot of the events we attend are smaller, club organised and quirkier affairs. These, I’m generalising, attract quirkier, less outcome focuses competitors. There are events out there to suit all. Not everyone’s cup of tea is a cup of tea. There is, it strikes me, a balance to be had, where all can meet in harmony. 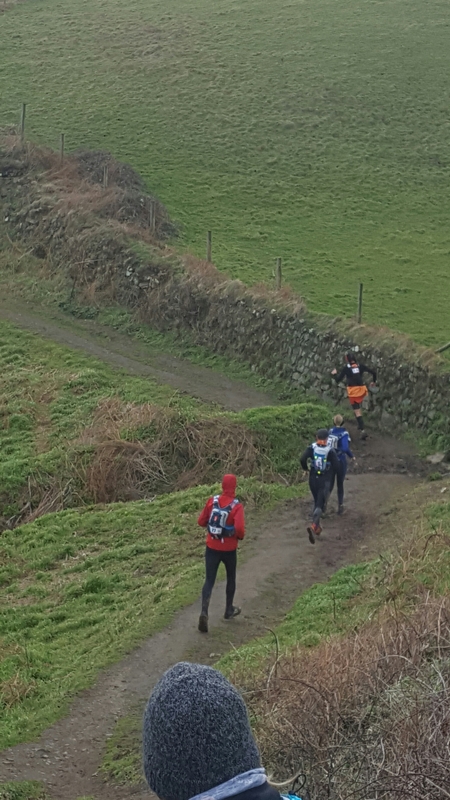 The closest I have found (in my opinion and experience) are the trail marathons , to be found mainly in the county of Dorset, attracting club runners, 100 marathon club runners and fancy dressed runners alike. These events are regularly won by top runners in crazy times, but with plenty playing beat the (super friendly) sweeper at the other end of the field. In any workplace, in any club, in any hobby, sport or pastime there will be people who get on with some and people who get on with others. There will be people who would rather be alone. There will also be those who embrace and acknowledge and encourage everyone regardless of relative ability, speed, kit, status , or some arbitrary, imagined position in a meaningless league table. I truly hope I am in the latter group. Hhhhmmmm, the quandary of age. I turn fifty in fourteen days time. Just a number. A number which gets bigger every year. But just a number. Having spent this week digging holes for fence posts, amongst other outdoor, physical and chilly activities, my body has a message for me. I turn fifty in fourteen days time. The old, new me (the one that had given up drinking and smoking but still lived in a dark head space and was yet to find the most incredible and powerful force that is LOVE) would have been worrying that he’d missed two planned runs this week due to utter fatigue. The new, new me just sees this as needed rest. I’m doing a five kilometer time trial in the morning and some serious miles on Sunday. They are going to be a whole lot more fun for the relative rest I’ve given my body.